I met Eric Cantor (R-VA) briefly, right before the mid-term elections. He was campaigning for Shelley Moore Capito, hitting all the local Jewish Republican groups on her behalf. Okay, there's only one. And it's pretty small. And it's informal, doesn't even have a name. Truth be told, we easily fit into someone's living room. Anyhow, I was impressed with him then and I'm even more impressed with him now. Yesterday I had the extraordinary opportunity to be part of a One Jerusalem bloggers' conference call with Rep. Cantor. It was exciting, really. The call had to be postponed thirty minutes because he needed to be present on The Floor. calling on the United Nations Security Council to charge Iranian leader Mahmoud Ahmadinejad with violating the 1948 Convention on the Prevention and Punishment of the Crime of Genocide and United Nations Charter because of his calls for the destruction of the State of Israel. in February - To take certain steps toward recognition by the United States of Jerusalem as the capital of Israel. Of course I've cherry-picked his record for what interests me personally; as the Republicans' Chief Deputy Whip, Cantor's involved with far more. But I find it very reassuring that in this volatile time (and in this lousiest of all Congresses) there is at least one stand-up guy who is interested and informed when it comes to the issues about which we care deeply. 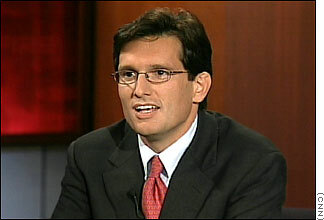 As noted on the Bluey Blog (by Rob Bluey of the Heritage Foundation), "Cantor... is one of those members who gets it." And best of all, Cantor has his own blog! It's written by a "spokesblogger," but we understand. The man's busy; he can't sit around the House of Representatives all day in his pajamas! The Democrats have already mired themselves in a storm of trouble. Speaker Pelosi and her party believe that they know how to run your lives better than you; they believe that the best ideas are found in Washington. They couldn't be more wrong. NOW TO THE NEWS, before I lose all you ADD BtB readers. Cantor has just introduced (with Shelley Berkley of NV) bipartisan legislation condemning the Islamic Waqf's recent and ongoing destruction at the Temple Mount. We are conceivably talking about the destruction of the remnants of The Second Temple. This is destruction (I hate to say it, but I can't resist) of biblical proportion. Three years ago, Pat Robertson interviewed (yes, Pat Robertson, but don't go away) archaeologist Gabriel Barkay of Bar Ilan University. PAT ROBERTSON: I am here in Jerusalem, and yesterday I was on the Temple Mount, and went over extensively what is being done there. You cannot believe what the Muslims have done... They have carved underneath the floor of the land adjoining the al-Aqsa mosque.... And in the process, they have excavated enough fill material to imperil the wall structure.... It is very serious.... I was there on that site. I had an interview with a man who is a leading archeologist here in Israel, to tell about a cultural Intifada..... It is not just an Intifada that deals with military action in Gaza and other parts of the West Bank; there is a cultural Intifada that is even more devastating. Here is that interview taken up on the Mount of Olives yesterday. I am here overlooking the Temple Mount with a leading archaeologist, Gabriel Barkay in Israel... We want to find out what is going on in the Temple Mount.... Can you tell us the situation there? GABRIEL BARKAY: Actually, the Temple Mount is a huge enclosure that is larger even than the City of David. That huge enclosure was created by King Herod the Great who, instead of a mountain, created a flat platform. He surrounded the mountain with a large shoebox-shaped arrangement of tall and heavy walls. These walls are retaining walls, behind which there is artificial fill, between the retaining wall and the natural slope of the mountain. So, instead of the mountain, we have now a flat platform. With the activities of the religious authorities of the Muslims upon the Temple Mount since the 1990s, with the construction of the al-Marwani mosque within the subterranean structure, including also paving of much of the area next to the al-Aqsa mosque, the very delicate equilibrium that existed there for many centuries was disturbed. Today the runoff of rain water does not penetrate the ground, but it penetrates the walls. The eastern wall of the Temple Mount got cracked. 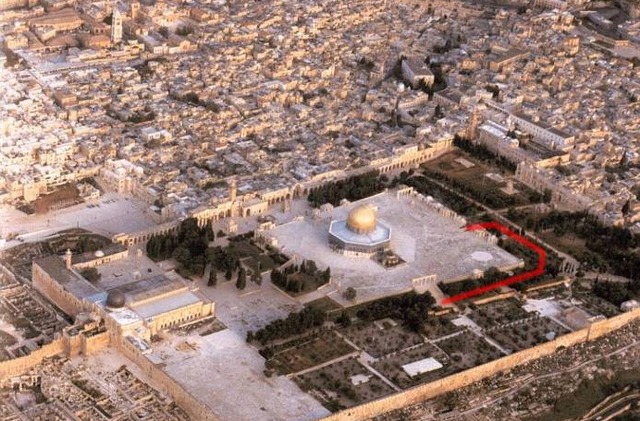 The south wall of the Temple Mount has a huge bulge developing on it, and the matter is, that the last earthquake, which took place in February of 2004, did not help too much. And with large crowds gathering upon the paved areas of the Temple Mount, we see a very, very dangerous situation. ROBERTSON: The bulge of the wall, I understand the Jordanians have moved in to try to reinforce it. Are they doing that? Is anybody doing that, to reinforce the wall? BARKAY: We can see from this point, that next to the southern wall of the Temple Mount there are scaffoldings against the wall. Along the -- or on the face of the eastern wall -- you can see scaffolding as well. This is the work of an Egyptian team. They work there. They carry out their repairs, which were achieved in a kind of a secret agreement between the Israelis, Palestinians, Jordanians and Egyptians. In 1996, the mosque, which was built into that place, that is a mosque that houses today up to 10,000 people. It is a huge subterranean mosque.... added as part of the illicit construction activity by the Wakfa authorities since the 1990's. ROBERTSON: What agreement was it that allowed the Palestinians to do this kind of work? BARKAY: Actually, there was no such agreement reached between the parties. 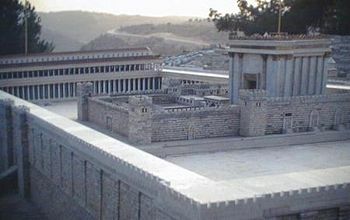 In the Camp David talks in 2000, President Clinton and others brought up the idea that in the future, there will be a division of sovereignty on the Temple Mount. Whatever is above ground [would] be for the Palestinians. That [would] include the mosques. And whatever is underground, which includes the remnants of the temples of the Jews and anything else, that would be Israeli sovereignty. And so the Muslims got the message and began to dig down and they began to fill in every subterranean hollow and every space which was there, to occupy it, in order to avoid any possible presence of Israelis later on, if and when a future solution is reached. Actually what we see is that the Temple Mount is regarded as a political matter, rather than a place to be cherished by all nations. ROBERTSON: This is Solomon's Temple and the place where Jesus walked. How does it get to be a Muslim holy site? BARKAY: Upon this rock, on top of the Temple Mount, which is now under the golden Dome of the Rock, upon that rock Abraham, according to Genesis 22, tried to sacrifice his son Isaac to God. The father-son sacrifice in Jerusalem go together, not only in the case of Abraham, but also with Jesus. In any case, that took place on the Temple Mount. Later on, David built upon that same rock, built an altar in the threshing floor of the Araunah the Jebusite, to stop the plague. His son Solomon built the first temple that was destroyed by Nebuchadnezzar, the Babylonian. Then later on, the second temple was built. 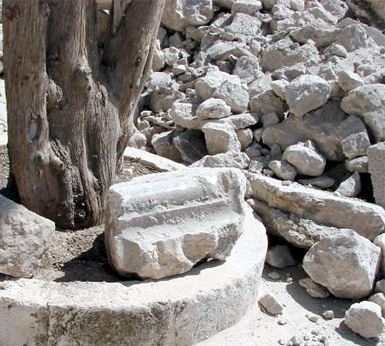 In any case, the place of the temple is the foundation stone of the Judeo-Christian common tradition. ROBERTSON: Is there any possibility that the Jews will take back sovereignty over the Temple Mount, which is their heritage, and prevent this desecration from going on? BARKAY: Following the Six Days War, the government of Israel declared Jerusalem a united city and the capital of the state of Israel. So Israeli sovereignty is all -- is upon all of Jerusalem, including the Temple Mount. On the other hand, it was clear that there would be much Arab and Muslim opposition to any activity of the Israelis upon the Temple Mount, so the day-to-day care of the Temple Mount was left in the hands of the Muslim religious authorities, the Wakfa. This was the situation until the 1990s. In the 1990s, that very fragile continuous situation got broken when a new mosque was built, and as for the future, you know that it is dangerous to be a prophet in Jerusalem. I am a Jerusalemite, but I am no prophet, so I cannot tell. See more on the "bulge" problem at TIME magazine - September 2004. The current devastation has yet to achieve mainstream media coverage anywhere near this magnitude. 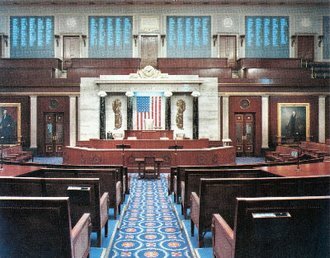 One of the many things the House Resolution can achieve is this sort of widespread attention. In the conference call, Rep. Cantor was adamant that all across America, people would be outraged - both Christians and Jews - if they only knew what was happening. 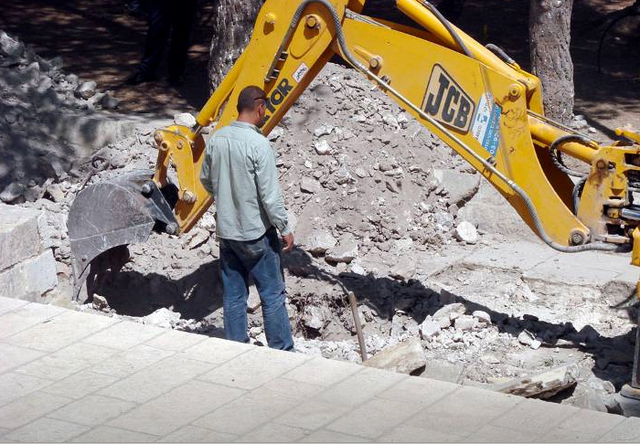 JERUSALEM – Islamic authorities using heavy machinery to dig on the Temple Mount – Judaism's holiest site – have been caught red-handed destroying Temple-era antiquities and what's believed to be a section of an outer wall of the Second Jewish Temple. ...the Waqf, the Muslim custodians of the Temple Mount, have been blasting [a massive trench] around the periphery of the holy site purportedly to replace 40-year-old electrical cables for mosques on the Mount. ... after bulldozers pulverized a trench 1,300 feet long and five feet deep, the Muslim diggers came across a wall Israeli archaeologists believe may be remains of an area of the Second Jewish Temple known as the woman's courtyard. The Antiquities Authority has not halted the dig and has not inspected the site. 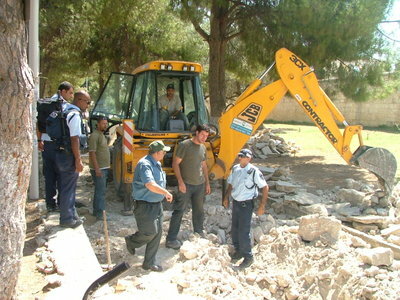 The Waqf has continued using bulldozers to blast away at the trench containing the wall. The last time the Waqf conducted a large dig on the Temple Mount – during construction 10 years ago of a massive mosque at an area referred to as Solomon's Stables – the Wafq reportedly disposed truckloads of dirt containing Jewish artifacts from the First and Second Temple periods. After the media reported on the disposals, Israeli authorities froze the construction permit given to the Wafq, and the dirt was transferred to Israeli archeologists for analysis. The Israeli authorities found scores of Jewish Temple relics in the nearly disposed dirt, including coins with Hebrew writing referencing the Temple, part of a Hasmonean lamp, several other Second Temple lamps, Temple period pottery with Jewish markings, a marble pillar shaft and other Temple period artifacts. The Waqf was widely accused of attempting to hide evidence of the existence of the Jewish Temples. For years the Wakf Authority - given control over the Temple Mount by Israel as a gesture of peace and trust after 1967 - unblinkingly denied that they were destroying artifacts. Then - as the Congressman noted - priceless ancient Jewish artifacts were found in a landfill where the Wakf had dumped tons and tons of soil removed from the area. After proof of the desecration was published, the Wakf transitioned from "we're not doing anything wrong" to "we have the right to do what we're doing." Hard to believe? Well you'd better comprehend it quickly because the Muslims, for their part, are wasting no time. Waqf official and chief Palestinian Justice Taysir Tamimi claimed the Jewish Temples "never existed." "About these so-called two Temples, they never existed, certainly not at the Haram Al- Sharif (Temple Mount)," said Tamimi, who is considered the second most important Palestinian cleric after Muhammad Hussein, the Grand Mufti of Jerusalem. This report today from Arutz Sheva makes clear that time is of the essence. "The problem is that the Prime Minister has neutralized all other elements - the Minister of Public Security, the Education Ministry, and the Antiquities Authority - and has taken full control of the situation. 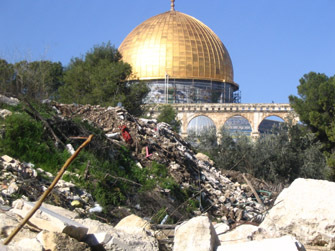 And the cycle is always the same: The government gives the Waqf a permit for refurbishing and the like, then the Waqf starts building and turning the area into a mosque, while destroying or hiding Jewish artifacts, and then we are not even allowed into the sites. This cycle has to be stopped!" "A staircase leads from the Temple Mount plaza downward under the Al Aksa mosque [south of the Dome of the Rock]," he said, "to two tunnels built by King Herod 2,000 years ago. The tunnels served the Jews who entered the Holy Temple from the Hulda Gate on the Southern Wall of the Temple Mount. Today, we see the Hulda Gate, but just to the left is a building called the Hatunya, built several hundred years ago. The Waqf wants to excavate the tunnels and the Hatunya, and, based on past experience, turn it into yet another mosque - while hiding or destroying Jewish artifacts." "In the past," Caspi said, "the government of Israel gave a permit for Waqf renovations in the Solomon's Stables area of the Temple Mount and under the Al Aqsa mosque [just south of the Dome of the Rock]. The bottom line was that the works were done without supervision, archaeological findings are feared hidden and destroyed, new mosques were built on the Temple Mount, and Jews are prevented from visiting the most important Jewish sites in history." "They should fax the Prime Minister's Office [at 02-670-5475 from within Israel; +9722-670-5475 from abroad] and protest the fact that his policies are allowing the Moslems to totally take over our holiest site and keep us, and our history, out." So GET TO WORK! already. If you need more information, use the search tool in the sidebar at left to go to any one of the 299 (now 300) BtB references to the Temple Mount. Michael Coren: "Political dialogue and religious understanding can only come about when politics is not hyperbole, and religion is not used as a tool for lies and mythology. To deny Jewish history is to deny the Jewish state. To deny history is to deny truth. To deny truth is to invite disaster." "The treasure's final hiding place - in the modern West Bank ... deep in Hamas territory - will rock world religions." JERUSALEM – Contradicting most of his colleagues, a former senior leader of the Waqf, the Islamic custodians of the Temple Mount, told WorldNetDaily in an exclusive interview he has come to believe the first and second Jewish Temples existed and stood at the current location of the Al Aqsa Mosque. The leader, who was dismissed from his Waqf position after he quietly made his beliefs known, said Al Aqsa custodians passed down stories for centuries from generation to generation indicating the mosque was built at the site of the former Jewish temples. He said the Muslim world's widespread denial of the existence of the Jewish temples is political in nature and is not rooted in facts. .... Gush Katif is miniature compared to the test of faith that awaits us. Lazer: You mean Jerusalem, Rabbi BT? Rabbi BT: Yes. The world will try to take it from us. Few Jews will remain loyal and steadfast in their belief (emuna, in the original Hebrew). Many will think Hashem has forsaken us, G-d forbid. "While I sit on a stone wall and look at the intricate tiles of the Dome of the Rock, some Jews are plotting to destroy it and Al Aksa mosque..."
On Yom Kippur, the morning Torah reading deals with the service in the Temple and the Avodah during the Musaf service relives in awesome detail the Yom Kippur rituals in the Temple in Jerusalem. Every Shabbos and holiday we recall the offerings brought for the community at the Temple. Chanukah is based on the rededication of the Temple; Succot we celebrate a remembrance of the Temple Service. On Pesach we remember the Korbon Pesach lamb which was eaten with matza and maror. The Pesach seder and the Ne'illah service (at sunset on Yom Kippur) both end with the proclamation, "Next Year in Jerusalem." On Tisha B'Av we fast and mourn the loss of the Temple and long for its rebuilding. At every brit milah, we begin by saying, "Happy is the man You choose and bring near to dwell in Your courtyards; we will be satiated with the goodness of Your House, Your Holy Temple." At every wedding we break a glass to recall that our joy is not complete while the Temple is still unbuilt. On Monday, the eve of the Sukkot holiday, the High Court of Justice handed down a ruling officially permitting Jews to pray on Jerusalem’s Temple Mount on Wednesday, between 7:30-9:00am. The court’s decision was in response to a petition filed by the Temple Mount Faithful organization. The ruling stipulated that in order to prevent a confrontation with Muslims, prayers must conclude by 9:00 o'clock, when Islamic worshippers usually arrive. The decision sets a precedent, as it permits Jews not only to visit the Mount but also to pray there. Such a position has not been taken by the court since at least 1976. The following are excerpts from a report about the movement of "martyrdom seekers" in Iran. Al-Arabiya TV aired this report on July 2, 2005. Reporter: These young women have forsaken the temptations of life, and have taken the hard way. Indeed, they have chosen martyrdom as a way of liberating the Islamic lands. This is what they say. Firooz Rajai: In the name of Allah, the Merciful, the Compassionate. We will not allow the Zionists to build their Solomon Temple in the place where the Al-Aqsa Mosque stands. They have not succeeded so far, and they never will. We are willing to sacrifice our bodies and souls to defend the Al-Aqsa Mosque. Our goal is to achieve martyrdom by way of true Jihad. Eric Cantor is a rabid right wing Ahole. He looks like a child molester. I can see his face peering into some little girl's windows.